In nearly every culture throughout history, women have been surrounded and cared for by other women during childbirth. 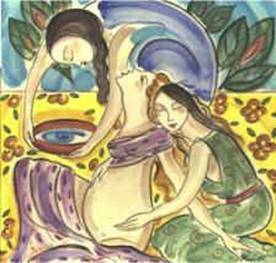 Artistic representations of birth throughout the world usually include at least two other women surrounding and supporting the birthing woman. One of these women is the midwife, who is responsible for the safe passage of the mother and baby; the other woman or women are behind or beside the mother, holding and comforting her(11). The modern birth doula is a manifestation of the woman beside the mother. Birth doulas are trained and experienced in childbirth, although they may or may not have given birth themselves. The doula’s role is to provide physical and emotional support and assistance in gathering information for women and their partners during labor and birth. The doula offers help and advice on comfort measures such as breathing, relaxation, movement, and positioning. She also assists the woman and her partner to become informed about the course of her labor and their options. Perhaps the most crucial role of the doula is providing continuous emotional reassurance and comfort. The doula’s goal is to help the woman have a safe and satisfying childbirth as the woman defines it. When a doula is present, some women feel less need for pain medications, or may postpone them until later in labor; however, many women choose or need pharmacological pain relief. It is not the role of the doula to discourage the mother from her choices. The doula helps her become informed about various options, including the risks, benefits and accompanying precautions or interventions for safety. Doulas can help maximize the benefits of pain medications while minimizing their undesirable side effects. The comfort and reassurance offered by the doula are beneficial regardless of the use of pain medications.